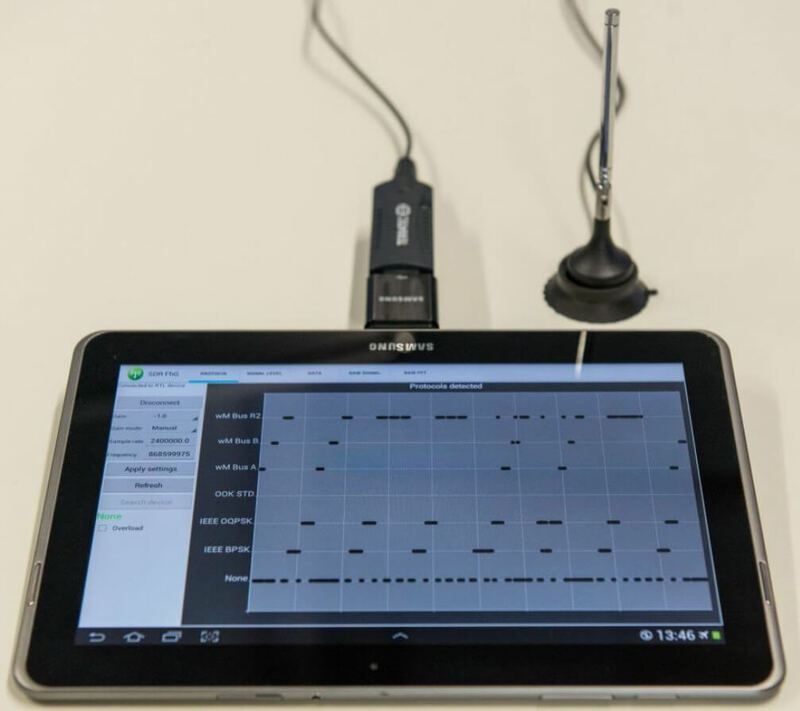 The Fraunhofer Institute for Integrated Circuits IIS has developed an Android app that allows you to analyze wireless traffic at 868 MHz using an RTL-SDR dongle. In Europe, many wireless IOT, metering and home automation radio standards operate in the 868 MHz band including ZigBee, M-Bus, KNX RF, EnOcean Radio Protocol and s-net. The software can automatically detect and recognize the wireless protocol being received. It can then be used to catalog what protocols are operating in a network, what frequency they are on and how active they are. That information can then be used for frequency and spectrum planning for new network setups. It can also be used for error diagnosis, intrusion detection and detection of interference. Numerous applications like smart metering, home automation, building automation, demand side management, ambient assisted living and industrial automation require reliable and cost effective technologies for wireless data transmission. For this purpose the license-free European 868 MHz Short Range Device (SRD) frequency band is prevalently used. Many different and incompatible communication standards and RF-protocols simultaneously occupy this part of the frequency spectrum. Possible negative effects could be interferences, over-occupancy, data collisions and as a result data loss. Special attention must be paid whenever wireless sensor networks are planned or operated. Therefore, network specialists need powerful and flexible tools that provide insights into the wireless data traffic for network planning, operation, fault detection and error diagnosis. The Traffic Detective is such a tool which is easy to use and does not need any knowledge of the different network protocols. The 868 MHz Traffic Detective is a software-based solution with a user-friendly graphical user interface for monitoring wireless data traffic. A cost-effective and commercially available DVBT USB stick based on a Realtek RTL2832U receiver chip can be used as an analog frontend. In addition to a PC-based implementation, the monitoring software is also available as an app for Android-based mobile devices. The researchers behind the software have also released an academic paper describing the technology used in the system. Unfortunately it seems that the app is not actually available for public download yet as we could not see any download links, or find it on Google Play. If you are interested in the app your best bet may be to contact the researchers by email directly. This is exactly what I’ve been looking for. I have some 868 MHz temperature transmitters that are still transmitting something, but apparently not the temperature since the receiver indicates they’re broken. I’ve been wanting to analyze them to try to determine what data they’re actually transmitting. According to the web site, the development of this application was funded by the German State of Bavaria. Given that, I would have expected it to be open-source, but I don’t see a download link anywhere. So I’m guessing that this is (unfortunately) commercial, but there’s also no mention of a price and no purchase link. Yeah, it’s not possible to find any public available app. I’ve found paper https://www.iis.fraunhofer.de/content/dam/iis/de/doc/lv/nsa/Paper/Embedded_World_2015_Traffic_Detective_A_UserFirendly_AndroidBased_Tool_FraunhoferIIS_Saalmueller.pdf from which You can conclude it’s even nothing new. I emailed them to ask, but they said the dongle it was designed for is no longer available (i’m guessing E4000?). They said they are working on updating it for newer dongles and to check the trafficdetective site (linked in post) for updates. It seems they mainly want to licence the technology though, and the app is mostly a tech demo. Nice info. Thanks for the followup.